You may remember James from an earlier story here. James is not his real name, but all other details are true. He has been a regular diner at our Senior Meals for years. Recently I saw him at our meal and this piece is based on my conversation with him. – Srijan Chakraborty. I saw James sitting at a table at the far side of the hall all by himself. I saw him from afar as I entered the Lake City Community Center. It was early on a Monday, still about an hour before noon. The usual crowd for our Senior Meals had not started to arrive yet. 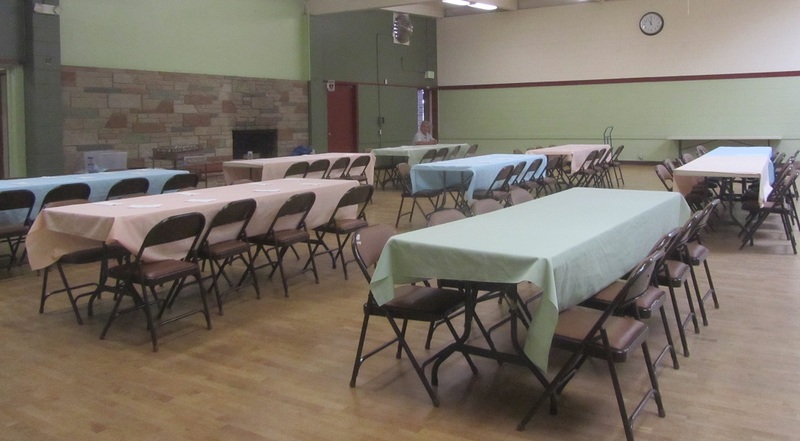 Our volunteers had already set up the tables with table cloths and place settings. They were waiting for diners and food to arrive before the lunch service begins. I hadn’t talked to James for a long time. So I decided to say hi to him. As I approached him, I saw a white band around his wrist, the kind you get when you are admitted to a hospital. Curious, I asked him if he was okay, but I really wasn’t ready for his answer. “I had a heart attack. I was just released from the hospital this morning.” He said it fairly casually, but that stumped me for a minute. That’s not what I usually expect to hear when I ask someone how they are doing. I mumbled something like “hope you are feeling better now”. Imagine getting released from a hospital after a heart attack and having no family or home to go to. I didn’t even have the courage to ask how he got into the hospital. Thankfully it was a Monday and he knew he could come to our Senior Meals, have a place to meet a few friends, and get a healthy hot meal before he is out again on his own, without a shelter. It has been more than two years since James fell into homelessness. He had a family, a job, a home. But one fateful accident one day he lost everything, and found himself on the streets of Seattle after many months in the hospital. What I find it so astonishing is that he is still hopeful that things will get better. James is a mild natured person. Years of life on the streets have failed to make him bitter. On my commute in the area, I often see him slowly pedaling his bike somewhere looking tired. When I told him that, he mentioned that his bike keeps getting stolen. As if life is already not hard enough for him, he needs to constantly worry about his stuff getting stolen. James’ story is just one of many thousands of stories of people experiencing homelessness in the Seattle area. With average one-bedroom apartment rent over $2,000 in Seattle and a serious lack of affordable housing options, it is no surprise that the homelessness issue has become an emergency in the city. The 2017 Count Us In report found more than 8,000 people homeless in Seattle (including people in transitional housing units and temporary shelters). Each of them have their own story and their own challenges. We need to hear every one of them. Our legislators need to hear every one of them. May be that will eventually make us take some bold actions? I didn’t end up staying that day for the meal service. I came back to office with a heavy heart and more resolve to keep doing what we are doing, and more.